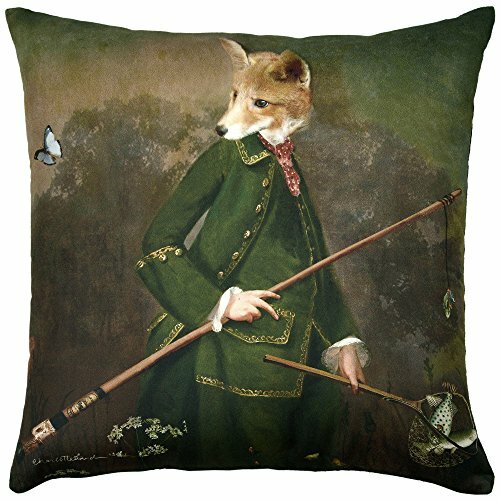 REGAL AND LUXURIOUS - Artwork by Charlotte Bird, our Mr Todd decorative novelty pillow is made by Adorabella in Australia from Velvet polyester fabric designed and woven in Europe. Mr Todd is wearing a tailored green suit and holding an old wooden fishing rod. CONTEMPORARY DESIGN - Our Mr Todd throw pillow is made with high quality soft touch velvet fabric that is a printed design of intense clarity, depth and color. The printed design creates a high quality image that is long lasting compared to most other printed versions. QUALITY MATERIALS - Pillow front is a 100% Velvet polyester fabric and the pillow back is a coordinated color faux suede polyester fabric. This material composition provides a crisp image and soft touch. CARE AND CLEANING - The pillow cover features a full width zipper to facilitate ease of removal of pillow insert for dry cleaning if necessary. This allows for easy cleaning and insert replacement if needed. ADDED VALUE - Pillow insert is new polyester fiber and is included. We will provide the necessary insert so you don't have to buy it separately as you usually need to, so the pillow is ready to use as soon as the order arrives. If you have any questions about this product by ADORABELLA, contact us by completing and submitting the form below. If you are looking for a specif part number, please include it with your message.